My Wandering Life: Lost Tooth. 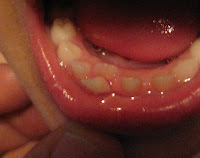 Really Lost Tooth. Well, the day I've been dreading has finally arrived. That tooth that has been hanging on for dear life finally let go and got lost. And by lost, I mean it is currently going for a ride through Benjamin's digestive tract. For literally the last three years I've been saying that when Ben loses his first tooth, I am going to fall over dead, or at the very least pass out cold. The boys have been very conscious of this, and at some point this evening, Nathan looked at Ben and said, "your tooth is gone". I was cooking dinner and talking on the phone to Michael. Knowing that interrupting Mommy on the phone for anything less than fire or copious amounts of blood gets the interrupter in serious trouble, they concocted a little plan to let me know about the loss. 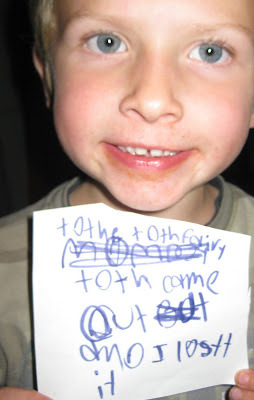 Together they made a small sign that read, "Mom my tooth came out and I lost it". Then they came up behind me in the kitchen and gently tapped me on the arm while smiling sweetly. I turned around, read the sign and SCREAMED at the top of my lungs, right into the phone (this way Daddy still got to be part of the fun!). I did not, as previously promised, drop dead or even , as feared, pass out. I calmly got off the phone and looked in Ben's mouth and around the living room floor. Alas, the tooth is really lost. Ben pointed to his side and said, "it's right here, poking me". Wonderful. 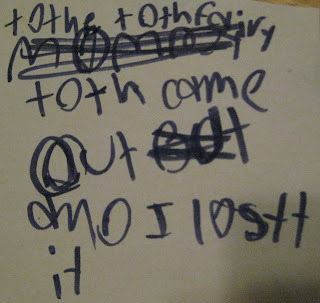 When I asked Ben what the Tooth Fairy (who hasn't ever made a trip to our house before) was going to do if there was no tooth to come collect, Nathan came up with the brilliant idea to cross out "MOM" on the note and instead write "To the Tooth Fairy" and slip that under Ben's pillow. I am as surprised as I could possibly be that I feel calm, cool, and collected. I am not breathing into a paper bag or sobbing uncontrollably. Instead I feel about the same way I normally feel when our littlest one hits a new milestone: joyful and ever so grateful that we have this little child with us to make our world just that much brighter. Today Ben turned Five-and-a-HALF, so it's a wonderfully fitting way to celebrate, don't you think? Heather, you're such a spaz. I'm glad some things never change. Let's just hope the tooth passes soon so that he doesn't grow a whole new jaw in there. That's what happens, isn't it?